I've previously waxed poetic about fruity scones and their uselessness to me. It's like I expect all the fluffy and pleasing deliciousness that muffins are known to deliver and am always let down by the dry texture and not-so-sweet flavor of the scone. Things have taken a turn now that I've been introduced to the savory scone. When eyeing its flecks of meat and cheese, one expects it to be reminiscent of a biscuit--less sugary and even a bit crumbly. The added bonus with a scone is that instead of having to construct your breakfast biscuit by hand (adding layers of bacon, cheese, egg, and the like), it's already built in! This particular batch was made to suit my tastes--I mixed in a healthy dose of shredded pepper jack cheese and a heaping helping of crumbled bacon. The sprinkling of salt and fresh-ground black pepper on top really turned on the taste buds and added a lovely look to the scones. Bonus--the amount of grease involved is incomparable to what ends up in orders from a fast food place. Combine the dry ingredients and cut in the butter until a coarse, crumbly mixture is formed. Mix in the buttermilk, cheese, and bacon using a fork until everything is moistened and then turn the batter out onto a floured surface. Form into 2 6-inch wide disks. Apply an egg wash and sprinkle with salt and pepper, then cut each disk into 6 wedges. Transfer to a baking sheet and bake for 15-20 minutes. This sounds like such a delicious idea! I am going to have to try these! I love scones and those are definitely a winner! I love scones. Not the ones at that coffee store which are dry, crumbly, and fairly tasteless, but homemade ones with lots of butter and buttermilk in them. Which I see you have included in your recipe. Que foto, dan ganas de coger un trozo dese aquí. sweet jesus grace, those are just fabulous! let's eat a bunch of them with hot coffee and not complain but giggle away? Grace...you certainly know how to simplfy recipes and flavour them up real good. I've never truly been keen on scones...exactly because I don't fancy their dryer type texture. Now that's a breakfast! Yum! Are you kidding me! I am making this tomorrow, I have everything in my fridge to make it now!!!!!! Must. Have. SOON. Oh my word, that looks like heaven tucked into a scone! BACON!!! CHEESE!!! I got up, went to the kitchen, and made this as soon as I saw this post. I can't wait to taste one in the morning! I like the idea of scones. When done right, they are perfection. This usually requires a fair amount of butter. Now, your addition of bacon ... how can one possibly go wrong?! I echo the others: these scones are getting made very very soon. Bacon and Pepper Jack? I'm there! your scone recipe looks so gooood! WOW! These are right up my alley!! I'm not a sweet eater and I don't bake a lot, but throw some bacon and pepper jack cheese in the mix and I'm in!! I'm going to try these and I hope I don't screw them up. You know, I'm trying to go back on a diet...this isn't helping. Looks so yummy! I agree...it's all about the savory scones. With bacon? Even better. Mmmmm...I still have fond memories of an amazing cheddar scone I had last year. I would give anything for a pepperjack version right now! Savoury scones, in fact scones in general, are a staple for us, but i've never had them with bacon! I tend to do herby ones or cheese ones, but normally to serve with soup or something. I must investigate the addition of meat I think! I'm a scone-hater, too. But come on--bacon? You might have just converted me. I love all kinds of scones, Grace...even the ones with raisins or cranberries. (wouldn't you like a cinnamon scone? )But I can't deny the savory ones are every bit as appealing. And with cheese and bacon? Outstanding! Grace, you had me at bacon. This scone looks so good that I don't think I would want to share it with anyone. It's mine! Hooray for finding a scone you enjoy! This is a great breakfast on the go solution too. And, I want to go and bake some savory scones. Why am I looking at this before breakfast? Why don't I have any pepperjack cheese? Or bacon? These are definitely going on the menu for this weekend! Oh, yeah! I like breakfast sandwiches but seriously dislike that they fall apart. Plus, they never really have enough bacon your scones look like they are loaded in with it! The baker at our farmers market makes these sometimes & adds sundried tomatoes, yum! Nice. I love anything with bacon! I've never thought to make savory scones but I am now. Bookmarked. This is fabulous!I can just imagine how wonderful this must taste like, I'll definitely be making this soon.If you won't mind I'd love to guide Foodista readers to this post.Just add the foodista widget to the end of this post and it's all set, Thanks! Shhhh don't tell anyone but I've never had a scone:-) Your savoury version makes me thinks it's time I did. mmmmm bacon :) you've got me sold. and yes i'd rather have carrot cake too but those cookies were way easier/faster! When I saw the picture, I thought that the bacon was pepperoni and I was into it. Then I read that it was bacon and I was even more into it. This sounds so simple, I can't believe it! Bacon right in your breakfast bread! Magical! Savory scones are my favorite! This is the second post in a row I'm reading about bacon in some sort of baked good. It's giving me a major hankering for something like bacon pizza. 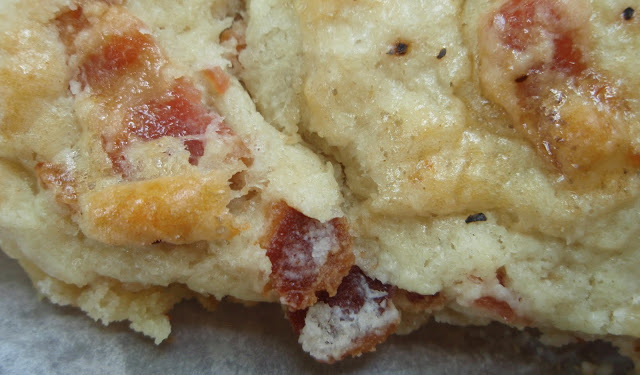 Bacon and pepper jack in a scone-brilliant! Why haven't I thought of this before? I love this idea Grace...what a super job! I had a muffiny fruity scone. Once. And it blew my mind. They are hard to come by though. The savory scone? A work of art. Oooohhh the savory scone. I remember when I first discovered the wonders of a savory scone. It had pancetta and cheese and chives.... this brings back all of those wonderful memories. That is one, mighty fine looking scone Grace. Bacon in my scones, I am there. Grace, thank you so much for the kind words regarding my anniversary. It was so sweet of you. Have a wonderful weekend! Oh my..the close up shot is just SO intense Grace. I want bacon now! Definitely a great time-saving breakfast idea too. Btw, sweet scones usually get slathered in clotted cream to counteract the un-fluffiness factor I think. Well, grace, these look perfectly irresistible. Definitely a worthy breakfast splurge! I bet your family is all spoiled with all your creative and delicious treat! I'm not a fan of scones either - they always seem so dry! Though add a bit of bacon...now I'm tempted. These would be great to use as the base for a fried egg sandwich. now thats a great way to enjoy your breakfast all in one scone! 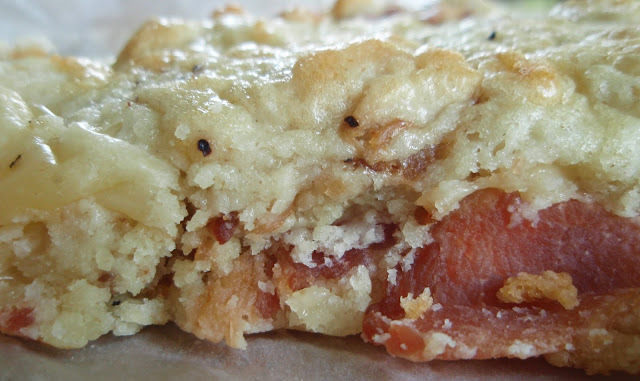 I love the idea of savory scones, and of course I love bacon!!! Wow, this is a winner. A breakfast scone is the best idea... I mean, a savoury breakfast scone. Oh wow, these sound amazing with the bacon and cheese in them - yum! Wish I had one to start my day tomorrow! I'm glad you've made your peace with scones :). These look like a very hearty satisfying breakfast. dang, those pictures are enough to give a girl heart failure... I've got to try these! These are now on my agenda to show my students. Otherwise I would eat all of them. Delicious. Grace... these look TOO good! I'm with you on the savoury preference, these will HAVE to be tried! I made some scones with sausage in it, and 2nd the awesomeness of savory, meaty scones. Ummm, YUM! That's all there really is to say about this one! I'll have to agree with you about the fruit: just leave it out of my scone! My favorite scone is Chocolate Hazelnut but Cheese and Bacon sounds like a close runner up! I'm sorry to hear about your sour attitude toward fruity scones but at least you've found refuge in the savory ones!